Please pray for the Holy Spirit to reveal truth to you, because many believers have been teaching false doctrine regarding the Jews and Israel. What you will see is that most of the sources on this page are from Jewish people. Be sure to read it all the way through, as it reveals who is a true Israelite, who is a true Jew, and who are the promised children of Elohim. Consider the following facts to see why Christians should NOT support the state of Israel. Rather we should pray for Jews to come to know their Messiah, who has already come and ratified the everlasting covenant with His blood as the Passover Lamb. The Jews are forbidden from possessing the land. The Jews were removed from the promised land when Elohim sent the Babylonians and then the Romans, against them; because of their disobedience to Elohim, and their worship of foreign gods. Many Torah Jews know this, which is why they protest against Zionist Israel, saying that it is illegitimate. For American Jews we have gone from a duty to support Israel to a duty to question Israel to a duty to oppose Israel. How many abuses must take place? How many laws like this that claim racism as the national character and ethnic purity as its goal?… my point is that at some point my duty as an American (and as a Jew) is to actively oppose an ethno-nationalist regime that is systematically undermining the human rights of people within its borders & threatening peace and int’l values. who would conceive of Jewish doctors driving a wounded man out of hospital and letting him die of thirst on a deserted road, who would think of Jewish soldiers breaking the neck of a young girl with a pink scarf for protesting against oppression. Who could imagine the education of Jewish girls as consisting of beating up and harassing women and children, or a Jewish soldier girl receiving a badge of courage for murdering a Palestinian boy who went to fetch his birthday cake. They believe that the Zionists have illegitimately seized the name “Israel” and have no right to speak in the name of the Jewish people! In this interview, Rabbi Yaakov Shapiro, rabbi of Beis Medrash of Bayswater, explains the motives behind the claims of Netanyahu and other Israeli leaders to represent all Jews. He explains how Zionism, starting from Theodor Herzl, unilaterally arrogated to itself the right to speak in the name of world Jewry. Rabbi Shapiro explains the motives behind this and the danger it poses to the Jewish people. 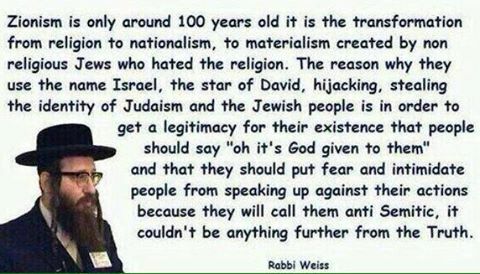 In this interview, Rabbi Weiss is sharply critical in his remarks of the ideology of Zionism, who wrongly claim to represent Jews. Since Torah Jews believe that the state of Israel is illegitimate in the eyes of Elohim, we should not support them either. Dr. Chuck Baldwin, who ran for President of the United States, teaches why Zionist Israel is Hell’s Greatest Hoaxes On America. Here is a short highlight that was taken from the two part sermons that are listed below. Steven Ben-Denoon of Israeli News Live proclaims that top ISIS agents are Israel MOSSAD. It is a shame to receive such news that Israeli Operatives are Leading ISIS in Mosul. This report comes after the fact that INL had once before reported from sources in the Israeli Military that had first shared this information with us. 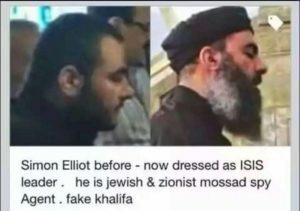 Simon Elliot, who is no doubt Israeli MOSSAD, leads ISIS; with the alias Abu Bakr al-Baghdadi. 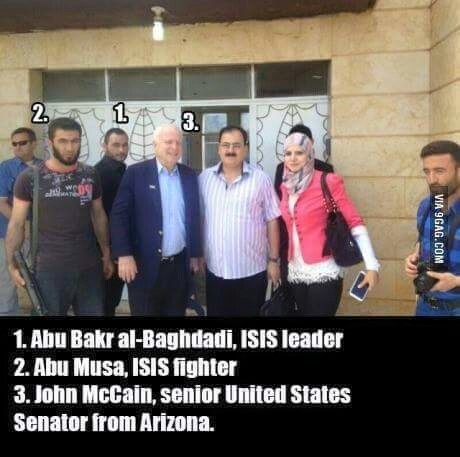 Here is Abu Bakr al-Baghdadi with John McCain. 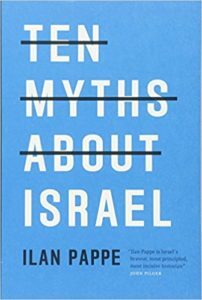 In Ten Myths About Israel, Israeli historian Ilan Pappe, who lives in exile in Britain, deals in this book with the myths of Zionism and exposes them as legends consisting of half-truths and fabrications of history. The Zionist narrative has only little to do with historical reality and truth. Likewise, the 1967 June war, which is also called the Sixth Day War, was not an act of self-defense of the “little David” against an overpowering “Goliath,” but an Israeli attack on which the Israeli security establishment has minutely prepared for years. He explores the claim that Palestine was an empty land at the time of the Balfour Declaration, as well as the formation of Zionism and its role in the early decades of nation building. DNA studies confirm that 97% of people who call themselves Jews, ARE NOT descendants of Abraham. 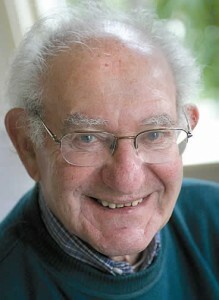 In 2001, Dr. Ariella Oppenheim (a Jew), a biologist at Hebrew University, published the first extensive study of DNA and the origin of the Jews. Her research found that virtually all the Jews came from Khazar blood. the land or to persecute the Palestinians, who they kicked off of the land. And Christians should not support them. Miko Peled, the son of the late Israeli general Mattityahu Peled, proclaims that the Zionist leaders of Israel are not Jewish. Judaism is not the religion of the Old Testament. 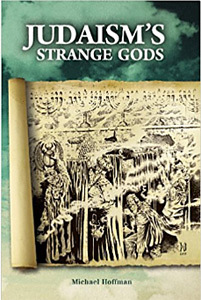 In Judaism’s Strange Gods: Revised and Expanded Christian scholar Michael Hoffman documents his provocative thesis that Judaism is not the religion of the Old Testament. It is the newly formalized belief system of the Pharisees, which arose in Babylon with the commitment of the formally oral traditions of the elders to writing, in the wake of the crucifixion of Israels Messiah and the destruction of the Temple. The Israeli army uses three internationally banned weapons in its military agression against the unarmed civilian population of Palestine. Israel uses Dense Inert Metal Explosive (DIME). DIME weapons spread inert metal atoms that penetrate the human body and are difficult to get out of human tissue. The second internationally banned weapon used by Israel is armor piercing bombs. The third internationally banned weapon used by Israel is white phosphorous, which mixes with oxygen to form a transparent wax and causes fires and thick, white smoke. When the human body is exposed to white phosphorus, it burns the skin and flesh; only the bones remain. The use of such banned weapons against humans is a flagrant violation of international law, especially the fourth Geneva convention. Shulamit Aloni, former Minister in the Israeli government, says that using accusations of anti-semitism is a trick, which Zionists always use. “Palestinians are fighting for their lives; Israel is fighting for the occupation. That we notice there’s a way on only when Jews are murdered does not cancel out the fact that Palestinians are being killed all the time.The Palestinians are fighting for their life, in the full sense of the word. Since their Egyptian Kaballah is based on witchcraft and astrology, which Elohim forbids, Christians should not support them. The six-sided star on their flag represents 666 and Satan. Solomon fell away from Elohim and he built altars to and worshiped false gods, such as Ashtoreh and Remphran. 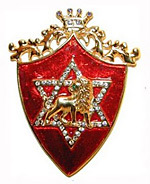 He used the star in his seal as a symbol of protection. It is the supreme symbol of satanic tyranny against Elohim and humanity, and has long been used in Egypt and Babylon magic, occultism, witchcraft and the casting of zodiacal horoscopes by astrologers. The Rothchild family finances and controls the state of Israel. This Hasidic Jew tells you the truth about Zionist “Israel” which was created for the Jesuit Rothchild family. Israel was created by the Jesuit Rothschilds as a nation-state to hide their money, and an opportunistic group – the Zionists – who would front for them. The Jesuits use the powerful Israel military to control the Middle East. Elohim said that the Israelites would be regathered, not just the Jews. The Jews are only 1/12th of the tribes of Israel, which descended from Jacob/Israel. People from the other Israelite tribes (tribe of Israel) also returned and lived in Galilee, where Messiah found many of His disciples. Because the regathering of Israelites already happened before Jesus first coming, we should not look for another Elohim-ordained regathering. This confirms that the modern state of Israel is illegitimate, and Christians should not support it. It DOES NOT say “Israel”, as there is no Israel. Abraham is NOT a physical Israelite or Jew, as they were descendants of his grandson, Jacob/Israel. Elohim had just told Abraham to leave Ur and all his comforts, and Elohim was reassuring him that He will protect him, provide for him and bless him. The angel wrestled with Jacob “spiritually” to help him come to the end of himself, his life of deception, and his living “out of the flesh“; and into a real relationship with Elohim, where he trusted Elohim to live through him. Israel represents a people who trust in Elohim by faith, not a place. It can’t be more clear!!! Abraham’s spiritual descendants, those who believe by faith in the atoning work of Yahusha/Jesus, are Elohim’s Chosen People, who have blessed the earth with the Gospel. Romans 9:6-8 says Abraham’s fleshly descendents ARE NOT the children of Elohim. Galatians 3:7 tells us that ONLY those who are of faith are the children of Elohim. Galatians 3:16 tells us that Messiah is the seed of Abraham. Because Elohims’s promises are to His spiritual descendants, Christians should not support the unbelieving leaders of the state of Israel. The Jews have been expelled from places 345 times since 100 A.D. They were kicked out of countries for being deceitful, lying, ritual murder, ritual murder of a child, crucifying a child; killing, stealing and destroying. That is once every 5.56 years. Here is a list with sources. Do they thank Elohim for restoring them after 1,878 years of exile? Do you hear Israel’s leaders mention the Elohim of the Bible? Are they bearing fruit for Elohim ? 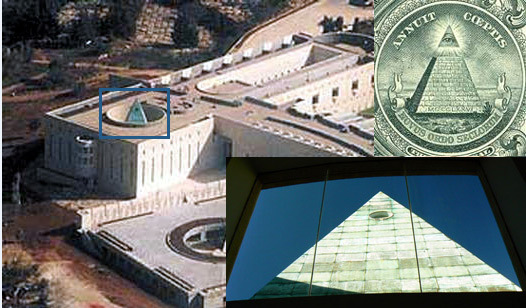 The Israeli Supreme Court building was funded and designed by the Rothchild family, and it features many Satanic, Illuminati symbols. The most prominent symbol is the green pyramid with the all seeing eye on it, which represents Satan, the god of this earth. There is also many Illuminati symbols in the building, and an obelisk, which represents Sun worship, which ultimately is Satan worship. The Israeli military attacked the U.S.S. Liberty in 1967, killing 34 and injuring 174. 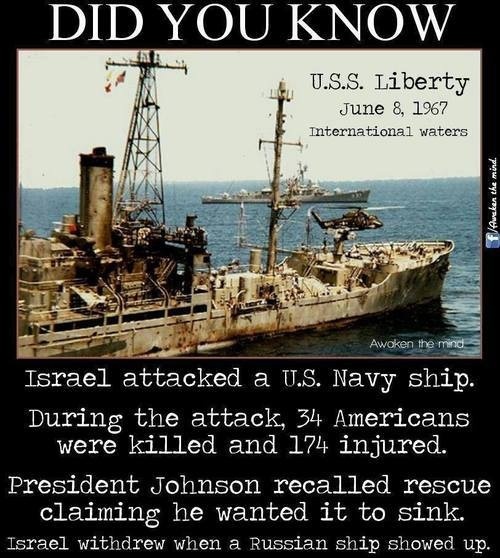 On June 8, 1967, US Navy intelligence ship USS Liberty was suddenly and brutally attacked on the high seas in international waters by the air and naval forces of Israel, killing 34 Americans and wounding another 174. The Israeli MOSSAD was complicit in the destruction of the towers on 9/11. The false narrative about 19 hapless Muslims with box cutters causing three steel-framed buildings to fall on 9/11 is a lie. Steel-framed buildings do not collapse on top of themselves, at near free-fall speeds, and end up as a pulverized dust pile. They obviously were destroyed with explosives. Building 7 was not hit by a plane, yet it was caused to collapse six hours after the planes hit. The link is to a study that gives many references about people who were involved that are Jewish. 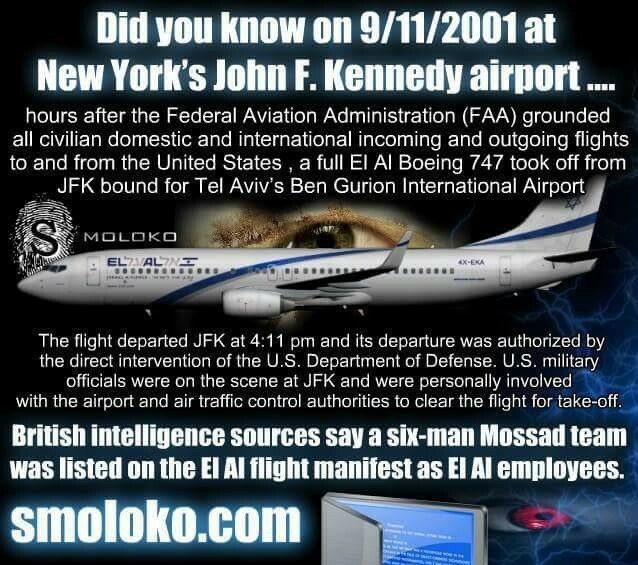 They are there because you need to see that the Israeli Mossad (and CIA) was behind the False Flag event. 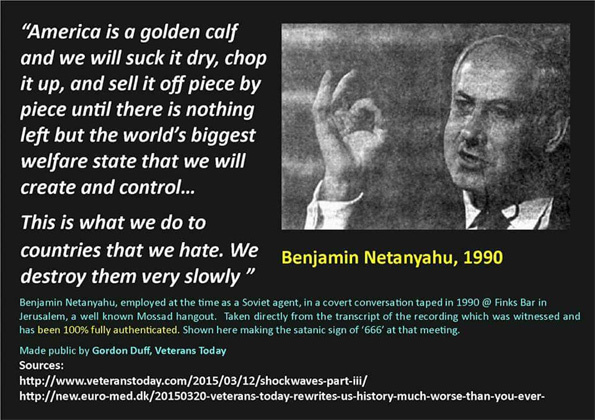 Here is what Israeli leader Benjamin Netanyahu really thinks about Americans. They say that they are Elohim’s chosen people, but their leaders represent Satan. ANY Christian preacher who actively teaches this FALSE DOCTRINE is also either miserably deceived or he is outright LYING, and may Elohim have mercy on him. Elohim’s Word prophesied that in the last days imposters would erroneously and falsely claim to be “Jews.” These imposters would persecute their enemies, especially the Christians. The Jesuit-Rothchild District of Columbia gives the Zionist state of Israel billions of Dollars every year, to fund their military system; and sticks Americans with the bill. 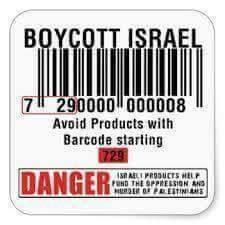 There’s not much we can do about that, but we can refuse to buy Israeli-made products, which can be identified by the number 729 at the start of the bar code. 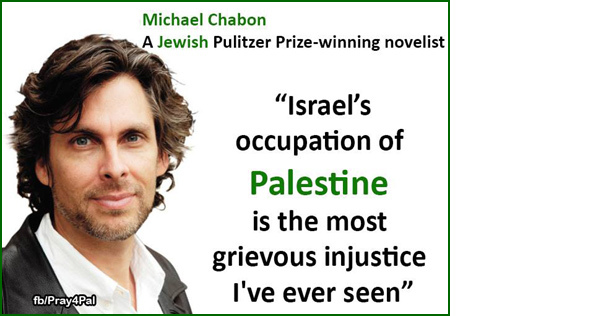 This entry was posted on August 17, 2018 by HKW in Global elite, Globalism, GOYIM, History, Israel, Jews, Racism, Religion, Uncategorized, Zionism and tagged Christianity, Christians against Zionism, Judaized Christianity, Michael chabon.